Personal Information means any information that may be used to identify an individual, including, but not limited to, a first and last name, a home or other physical address and an email address or other contact information, whether at work or at home. In general, you can visit WTKSoftware.com’s web pages without telling us who you are or revealing any Personal Information about yourself. Every computer connected to the Internet is given a domain name and/or a set of numbers, that serve as that computer’s “Internet Protocol” IP address. When a visitor requests a page from any web page within WTKSoftware.com, our web servers automatically recognize that visitor’s domain name and/or IP address. The domain name and/or IP address reveal nothing personal about you other than the IP address from which you have accessed our site. We use this information to examine our traffic in aggregate, and to investigate misuse of WTKSoftware.com, its users, or to cooperate with law enforcement. See also “Disclosure to Third Parties” below. We do not collect and evaluate this information for specific individuals. When you use co-branded services or those provided by a third party within WTKSoftware.com, your Personal Information may be passed to that third party provider. Its use of your Personal Information is subject to their applicable privacy policies. If you are make a purchase from WTKSoftware.com, your name, e-mail address, mailing address, credit card number and expiration date are requested. This information allows your orders to be processed and fulfilled. Credit card and e-mail information will not be shared or sold to third parties for any purpose. Wherever your Personal Information may be held within WTKSoftware.com or on its behalf, we intend to take reasonable and appropriate steps to protect the Personal Information that you share with us from unauthorized access or disclosure. WTKSoftware.com may use a shopping cart feature that safeguards your Personal Information by using industry standard SSL (Secure Socket Layer) certificate. SSL software encodes data transferred between you and the server. WTKSoftware.com is not responsible for any Personal Information you disclose to third party affiliates that do not use SSL software or do not offer a secure way to transfer information. 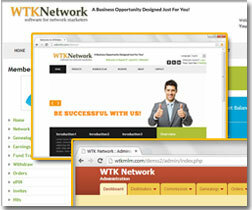 Some pages on the WTKSoftware.com web site include links to third party web sites. These sites are governed by their own privacy statements, and WTKSoftware.com is not responsible for their operations, including but not limited to their information practices. Users submitting information to or through third party web sites should review the privacy statement of those sites before providing them with Personal Information.